From Hiway 83 south of Valentine, turn west on 16B and go to end of pavement and than go 4 miles further west. You will than see the cemetery. You can also go south of Valentine on Hiway 97 to where it joins 16B and than go 1/2 mile east. Section 27, Range 30, Township 30. Tradition assumes many forms in the sparsely settled Sandhills. Some names survive more than a century, long after the namesake passes on. The Kennedy Community, for example, derived its name from one of the earliest settlers to file a homestead some 40 miles southwest of Valentine. B.E.B. Kennedy, former mayor of Omaha, came to file a homestead shortly after a friend, Captain David Piercy, filed his in 1883. Piercy, a veteran of the Union Army, applied for a post office and submitted the name, Piercy, which was rejected. Kennedy was accepted and the Kennedy Post Office opened May 8, 1886 with Piercy as postmaster. For several years postal patrons in the heart of the county traveled 20 to 40 miles for their mail at Kennedy because, at the time, other post offices were located along the northern edge of the huge county. In 1889 Cyrus King, who carried the mail with team and wagon from Valentine once a week, approached Rev. J.M.Bates, who had recently arrived to serve the Episcopal Church. He asked that Rev. Bates travel to Kennedy for church services. Rev. Bates traveled the distance in September when the summer heat had passed. The first service, with 27 in attendance, was held in William and Margaret Erickson's home made of part sod, part lumber. One family made the trip in several hours with two oxen and open range cowboys came wearing spurs. Scheduled services were held in different homes for several years until "the settlers built a sod church on a grassy knoll with a burying ground all around near the Kennedy Post Office and the Piercy's home," according to Erickson family papers. The sod structure measured 24 by 19 feet. It was named All Saints Church and dedicated on All Saint's Day. Gray plaster covered the inside walls and the altar made of sod. Furnishings included a beautiful red cloth on the altar, crude benches and a baby Mason and Hamlin organ that came from Vermont. David Piercy's daughter, Nellie, was married at the church in 1892. There were three burials at the cemetery in 1892, all relatives of Mrs. William Erickson. Mary King, only 31 years, died in childbirth with her baby, Bessie. That same year Mary's 5-year-old son, Gilbert, was dragged to death by a horse. The next year Matilda Wallingford, mother of 13 children, died at 58 years and was buried on the sandy knoll that rises abruptly from the meadow. The Wallingfords operated a sawmill to the north along the Snake River. Caroline Nye, wife of pioneer bridge builder for Canton Ohio Bridge Co. and rancher John Nye, died at 66 years in 1899 and was buried in the churchyard. Her daughter Lida had married John Bachelor, a partner in the Nye Ranch before Bachelor moved his cattle operation to the Boardman Creek in the Kennedy Community. After a time a frame church replaced the sod structure. Confirmations, baptisms and burials continued for a few years until most of the settlers, unable to make a living on the barren prairie, moved on leaving only a few ranchers. The church building was sold, but its influence remained. Through the years crude markers became difficult to read or may have disintegrated leaving some graves unmarked. In 1959 Horace Wallingford, whose mother is buried there, commissioned a stone to be erected. 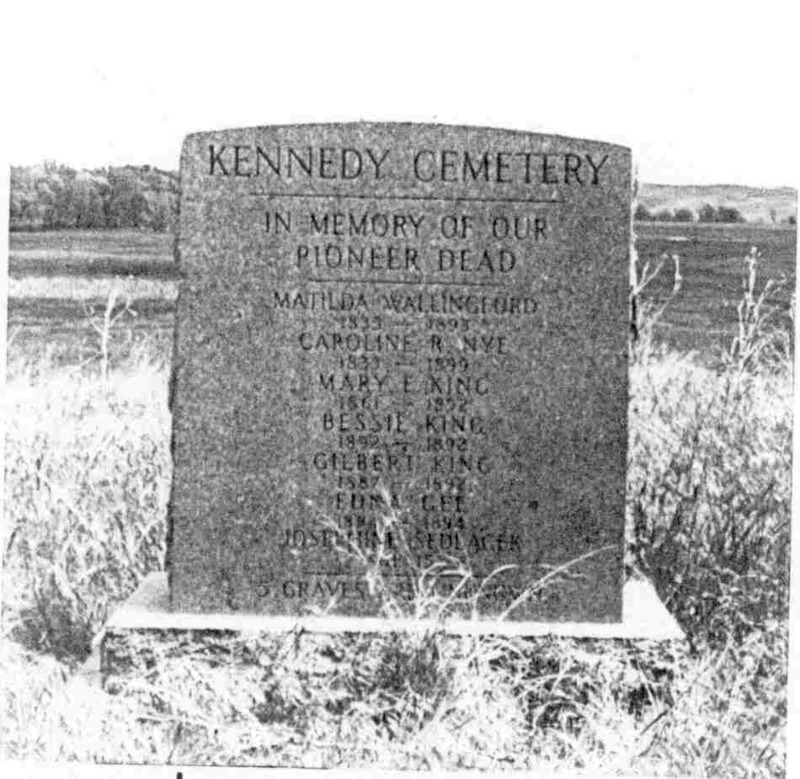 An inscription reads: "Kennedy Cemetery In memory of our pioneer dead." Seven names and their dates are chiseled into the stone: Matilda Wallingford, 1835-1899; Caroline R. Nye, 1833-1899; Mary E. King 1861-1892; Bessie King, 1892-1892; Gilbert King, 1887-1892; Edna Gee, 1894-1894; and Josephine Sedlacek, age 15. "Five graves unknown," was noted at the bottom. As curator of the Cherry County Historical Museum during the early 1980s, Ruthie Harms researched old newspapers and church records to find burials recorded there that were not included on the stone. After years without activity, a new stone marker was erected in 1999 along side the memorial stone. Dwain Hamit, the son of Charlie and Edna Hollers Hamit, spent his youth a few miles south of the cemetery on Lone Tree Lake. Although he moved to Oregon, his instructions were to be cremated, the ashes placed in a blue fruit jar and buried at the Kennedy Cemetery. On October 7, 1998, Hamit suffered a fatal fall while sawing limbs from a pine tree. His wife made arrangements for a stone to be erected and traveled to the Kennedy Community in June 1999 to fulfill Dwain's wishes. Possibly the ornate oak box used for burial contained ashes in a blue fruit jar. Nearly 50 relatives, friends and neighbors gathered on the grassy knoll for the ceremony. Sweet peas, penstomen and spiderwort were in bloom throughout the cemetery that overlooks a broad expanse of subirrigated meadow. A sturdy barbed wire fence deny entrance by cattle. A pine and cedar tree shelterbelt planted by Capt. Piercy's son, W.W. Piercy, provides a towering backdrop, shelter from the wind and privacy from a county road a short distance to the north. In recent years Gordon G. and Sheila McLeod researched and marked the graves of two infants who died of scarlet fever after the turn of the century and were buried near their homes. The post office was moved a quarter mile northeast from the cemetery where Bill and Nancy Kennedy operated the office from 1906-1911. The Kennedys moved farther west to Chesterfield where Nancy was postmaster from 1913-1923. Gordon's grandmother, Sarah McLeod became Kennedy postmaster in December,1911. Gordon, who now lives at that location, said his father, Gilmore McLeod, was asked to dig the grave, possibly in 1909, for little Jane Ellen Kennedy, the infant granddaughter of B.E.B. Kennedy. Following research the McLeods erected a marker in the yard behind their home for the Kennedy child and helped Garrett Swanson mark and fence the burial spot of Johnny Erickson, the infant son of William and Margaret Erickson. The Erickson homestead was more than two miles west of the Kennedy Cemetery and now is part of the Swanson ranch. Why the infants weren't buried in the cemetery remains a mystery. Could it be there was some stigma associated with a highly contagious disease that took so many children at that time in our history? Contributed and written by Marianne Beel, local writer and historian. It was the custom to bury stillborn babies and babies that died shortly after birth in the yard of the homestead if no cemetery was close by. Than, lilacs, bouncing betty, or some type of hardy flower or bush would be planted on the little grave. We apologize for any errors in reading or transcribing of information. For corrections, please contact the Cherry County Coordinator. Information on births and deaths donated by Ruth Harms who walked the cemetery in 1974. Story written by Marianne Beel, local area writer and neighbor..